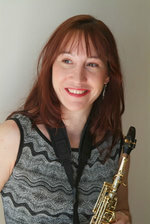 Katia Beaugeais is an award-winning French-Australian composer and saxophonist based in Sydney. She is a Vandoren Paris and Selmer Sax Artist. Since winning the prestigious 2010 ISCM/IAMIC International Society for Contemporary Music Young Composer Award, Beaugeais's music ranging from solo saxophone to full orchestra has been performed in America, Canada, Croatia, Slovakia, Austria, Scotland, Ireland, England, France, Peru, Taiwan, Thailand, Australia and New Zealand. This year, Beaugeais is featured soloist-composer on an ABC Classics radio podcast, where she is interviewed and performs her latest soprano saxophone piece, Breath by Breath, alongside new Australian saxophone works composed specially for her. Recent CD releases of her music include Like Snowdrops You will Shine, commissioned for the Australian Chamber Orchestra Collective/ABC Classics Hush Foundation CD, and First Light at Uluru, recorded by world-renowned didgeridoo player, William Barton, and the Royal Australian Navy Band. Beaugeais's music was chosen for ACO's 2019 worldwide selected playlist celebrating "incredible female artists" and shortlisted for ABC's Classic 100. Other highlights include: performances of her music by Professor Kyle Horch and the Royal College of Music Saxophone Orchestra in London, Royal Northern College of Music in Manchester, England, 2011/2013 Zagreb Biennale, Ensemble Zeitfluss (Austria), Elly Bašić Music School (Croatia), Sydney Symphony Orchestra Fellowship players, Queensland Symphony Orchestra composer workshop, Sydney/Melbourne Conservatorium Wind Symphony, Adelaide Wind Orchestra, ANBOC Festival, Baylor University, Texas Woman's University Wind Symphony, and guest soloist-composer at the 2018 World Saxophone Congress in Zagreb, Melbourne's 100 Saxophones and Selmer Sax Showrooms in Paris, performing her own saxophone concerto for ABC Classics, invited on a new music panel by Professor William Street with the legendary Jean-Marie Londeix at the Strasbourg Conservatoire, and interviewed on Boulevard des Productions Strasbourg TV. Beaugeais teaches composition at the Sydney Conservatorium of Music, where she is completing a PhD in Composition with an extensive research focus analysing the dual role of a composer-performer. First light at Uluru : for wind symphony (2016) Commissioned by Dr John Lynch & the Sydney Conservatorium of Music, and Matt Klohs. First light at Uluru : for saxophone orchestra (2015) Commissioned by Diana Tolmie, Queensland Conservatorium Saxophone Orchestra.